Here on Vanity Frills, I'm no stranger when it comes to discussing my skin complaints. If you're a regular reader of my blog, you will know that I have highly sensitive skin. Whilst browsing the internet recently, I came across a campaign that I really liked the sound of which is called Experience My Rosacea. The idea behind the campaign is to raise awareness of the difficulties that rosacea-sufferers encounter on a day-to-day basis. There are also a lot of common misconceptions that surround the condition and the campaign aims to challenge those. I have combination skin and I have been suffering with both rosacea and acne for around 4 years now. Some weeks can be far worse than others, where every little thing can trigger my redness to flare up and for my skin to break out. I have learnt by now that 'knowing' your skin is so important and I am forever checking which factors agree or disagree with me. For example, at times of stress or when my anxiety worsens, I will break out around my t-zone and my rosacea will become far more noticeable at the tip of my nose and around my cheeks. When it comes to rosacea, sadly it is far more common for those of us with a pale complexion, and tends to also be more common in women. It is a relapsing condition and some days it is a lot more noticeable than others. There can be a variety of potential triggers for rosacea such as stress, strenuous exercise, alcohol/caffeine consumption and even eating certain things, particularly spicy foods. I try my best to monitor when my rosacea flares up and I mostly pinpoint mine to stress. I am naturally a very anxious person and the smallest situations or issues at work can overwhelm me. As much as I try to be cautious with my diet, I find that settling on a skincare routine is most crucial. Due to the sensitivity of my skin, I have found that un-fragranced products suit me best. 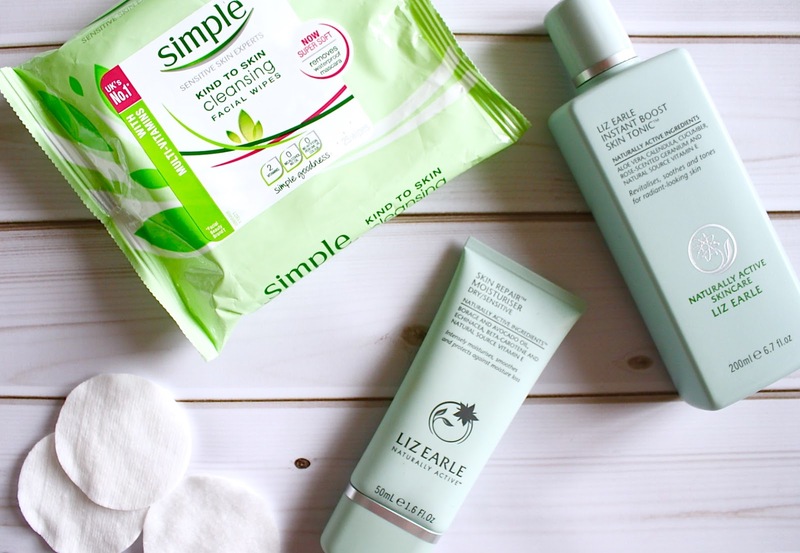 My day-to-day skincare routine consists of removing the majority of my eye makeup with Simple facial wipes and following this by removing the bulk of my makeup with the Liz Earle Hot Cloth Cleanser. This method really helps to soothe my skin and I find it relaxing after a long day at work. I also use the Liz Earle Instant Boost Skin Tonic and follow this with the Liz Earle Skin Repair moisturiser. As these products are un-fragranced, they do not cause any aggravation to my skin and the gentle circular motions when applying the products help to massage the areas where I am experiencing redness. I have also been taking Erythromycin on and off for some time now, being prescribed it for 3 months at a time. 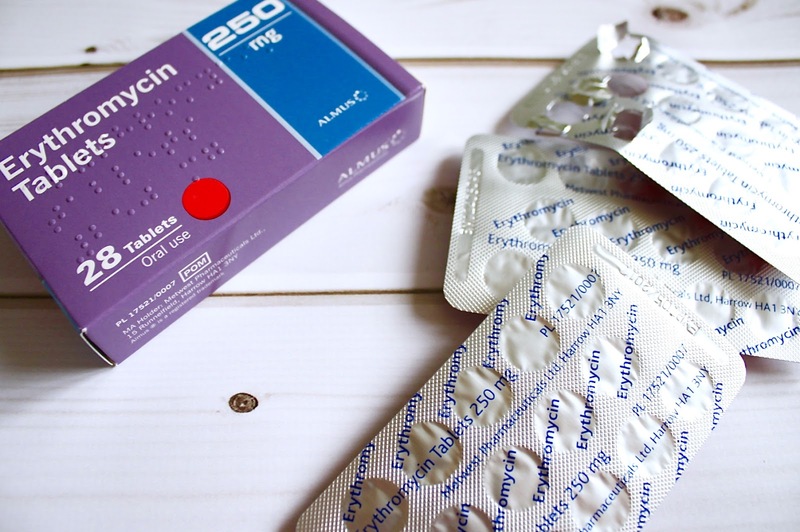 Oral medications are known to greatly benefit rosacea/cystic acne sufferers and I have found Erythromycin to help me the most. I have been prescribed various gels in the past which have aggravated my skin and tablets have been the most effective solution. I currently take these twice daily and after just 6 weeks, I always notice that they have a big impact on my skin; my lymph nodes become less swollen, my cystic acne reduces and with that, the redness from my rosacea reduces too. I will sadly always have an element of scarring around my t-zone and chin area but taking Erythromycin gives me a big confidence boost. Don't be afraid to speak to a doctor. The first time around when my skin became problematic, I went to see a doctor and they put me onto oral medication. After 6 weeks, it cleared my skin up and I felt silly for not visiting the doctor sooner. When my skin flared up again several months ago, I put off going to the doctors as I let my anxiety get the better of me. Now, looking back, I'm wishing I had gone sooner as my skin could have potentially been almost clear by now. It's okay to not wear makeup. Wearing makeup can be a vicious cycle when you suffer from rosacea and acne. I find that my skin becomes incredibly dry when I'm having a flare up and that makeup won't 'settle' into my skin. Some days I feel as though I need to wear makeup to feel confident, yet wearing makeup can cause me to feel insecure as it just 'won't go right' when my skin is bad. Your skin needs to breathe sometimes and you shouldn't feel obliged to wear makeup if you don't want to. Keep your skin clean. The moment I stepped foot into the doctors surgery several months ago, my doctor told me that I wasn't keeping my skin clean. I was using virtually every product under the sun yet I wasn't seeing any change in my skin's condition, despite many products being labelled as suitable for acne/rosacea-prone skin. Thoroughly washing your face with clean water and a muslin cloth is vital to freshen up your skin in the mornings/evenings. If you can find products that agree with you, then even better. Just think how clogged up your pores can become from wearing makeup and even from the air in built-up areas. Fake tan has become my best friend. Okay, this is a little bit of a superficial point but it really does boost my confidence when my skin has a glow. I have been applying St Moriz tanning lotion to my face and body on a weekly basis and it helps to minimise the look of my rosacea. Fake tan may not necessarily be for everyone, but the added glow has also meant that I haven't felt such a need to wear a heavy face of makeup daily. Drink lots of water. Toxins within the body can cause the skin to inflame, creating clogged pores and acne. Water helps to flush out the nasty toxins from your skin and will also aid fending off acne. Drinking water is such an easy step to add into your daily routine and it will be beneficial in the long run. If you are currently living with rosacea and would like to share your advice/what helps to boost your confidence on a daily basis then I'd whole-heartedly recommend getting involved with the Experience My Rosacea campaign. Likewise, it's a great place to share your frustrations and look to other blogs for further advice and information on the condition. Or if you would prefer, you can take to social media using #ExperienceMyRosacea. I totally agree with you, I'm only struggling with acne but since I went to a dermatologist my skin improved, an advice it's to use only oil free and non comedogenic makeup, don't use maybelline, l'oreal, Revlon,Mac my dermatologist forbid me those . Liz Earle is great for sensitive skin, my mantra is avoid anything that foams like its the plague!! Sounds like your Rosacea might be due to gut bacteria's if it's antibiotics that help you the most. There are a lot of studies that are starting to prove the link between gut bacteria (caused by food intolerance/other) and rosacea flairs... have you tried eliminating food groups like dairy?